I recently received a forwarded newsletter from a colleague with the introduction, “Darn science teachers!” What on earth could he be referring to? Science teachers are awesome! The Columbia Basin Bulletin distributed a newsletter article about how teachers are inadvertently releasing invasive species into the environment. According to a study funded by National Oceanic and Atmospheric Administration and conducted by Sea Grant, my colleague was complaining about a common issue across the U.S. and Canada. Of teachers surveyed one out of four educators who used live animals as part of their science curriculum released the organisms into the wild after they were done using them in the classroom. Washington has only one native crayfish species, the signal crayfish (Pacifasticus leniusculus). Invasive species have begun to appear in norhtwest rivers. Researchers found as many as 1,000 different organisms used by the teachers. Many of these species are known or potential invasive species including elodea, crayfishes, amphibians, mosquito fish, red-eared slider turtles and other aquatic plants and snails. So what does it mean to be an invasive species? Some non-native species are benign or may even be good for the environment. But populations of other non-native species explode after introduction, significantly harming the environment or human health. Invasive species may harm native species by competing against them for food, space or other resources. They can endanger human health by introducing parasites and pathogens. Once established, most nonnative species are impossible to eliminate. You can learn more about the non-native crayfish in the Northwest from this Oregon Field Guide segment from 2011. 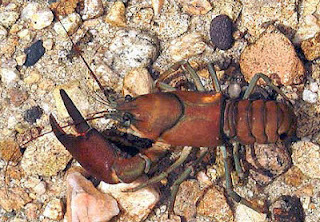 Oregon Field Guide: Crayfish Invasion Eastern crayfish invade Oregon rivers through a surprise route: 4th Grade classrooms. Don’t forget, in my opinion, science teachers are awesome! In the same survey where teachers reported releasing invasive species they also told researchers they don’t want to be part of the problem. They want to be part of the solution. In Washington several organizations have gathered together to come up with a solution. The University of Washington, Pacific Education Institute, Washington Department of Fish and Wildlife (WDFW), and the Office of Superintendent of Public Instruction (OSPI) have collaborated to get local, native crayfish into classrooms. Having live species to observe and care for is an important component of student learning. It is much more engaging for students to see the “structures of life” first hand. Caring for an organism and learning about the proper components of its ecosystem, rather than watching a video clip or reading about it in a book, also increases student enthusiasm. As scientists and researchers undertake the multi-pronged approach to educate teachers and citizens, the message filters into the classroom. Our students aren’t just learning about crayfish; they are gaining an understanding of our environment. Learn more about invasive plants and animals in Washington and how they are being managed from Washington Invasive Species Education (WISE) webpage.